The UK referendum has affected all currency pairs in forex. 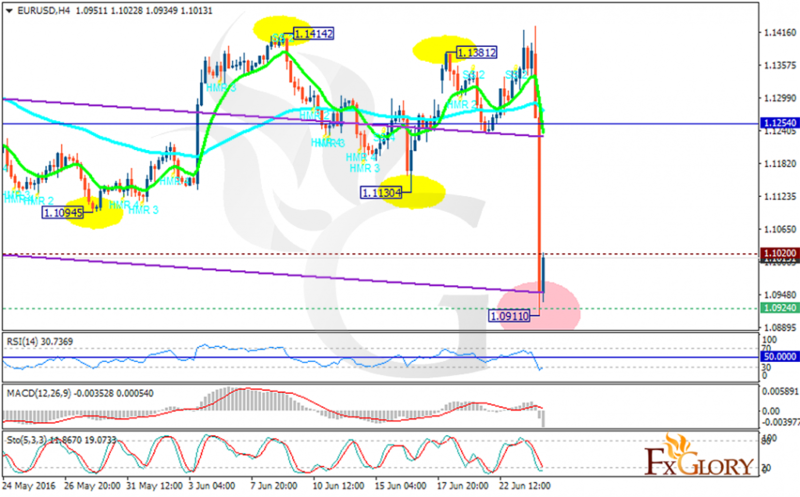 For EURUSD it weakened EUR and the price fell down. Moreover PMI Composite from Markit left a negative impact on EUR as well. Early today the price fell to 1.09110 but it is trying to make a correction and rise. The support rests at 1.09240 with resistance at 1.10200 which both lines are below the weekly pivot point at 1.1254. The EMA of 10 is falling down along with the EMA of 75. The RSI has reached the oversold area and it is going up. The MACD indicator is in neutral territory but the Stochastic has reached the 20 level and might rise again. The resistance level breakout will push the price to higher ranges targeting 1.1450.